The identity area is where "information is conveyed which uniquely identifies the entity being described and which defines standardized access points for the record" (ISAAR 4.4.1). ICA-AtoM ships with a drop-down menu using a default taxonomy of three core types (corporate body, person, family); these cannot be removed or edited, but editors or administrators can add new types. "Record the parallel form(s) of name in accordance with any relevant national or international conventions or rules applied by the agency that created the authority record, including any necessary sub elements and/or qualifiers required by those conventions or rules. Specify in the Rules and/or conventions element (5.4.3) which rules have been applied." (ISAAR 5.1.3). This is a multi-value field: enter as many names as you like. 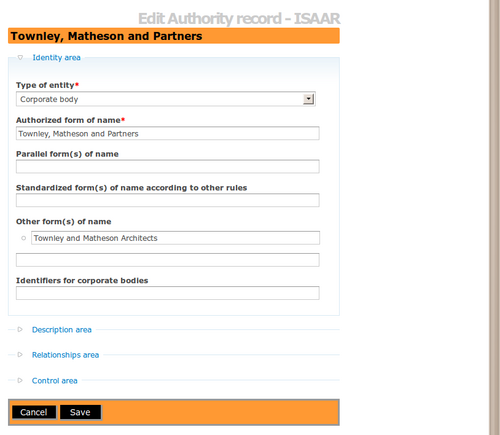 "Record the standardized form of name for the entity being described in accordance with other conventions or rules. Specify the rules and/or if appropriate the name of the agency by which these standardized forms of name have been constructed." (ISAAR 5.1.4). The purpose of this field is "To indicate any other name(s) for the corporate body, person or family not used elsewhere in the Identity Area." For rules and examples, see (ISAAR 5.1.5). This page was last modified on 17 June 2010, at 15:09. This page has been accessed 6,458 times.